Well this is it folks. This is (supposedly) the last round of LudoBites as we know it. As old-school readers may recall, LudoBites v2.0 was my first ever pop-up, back in the halcyon days of 2009, back when the food blogging scene here in LA was still new, inviting, and cohesive. 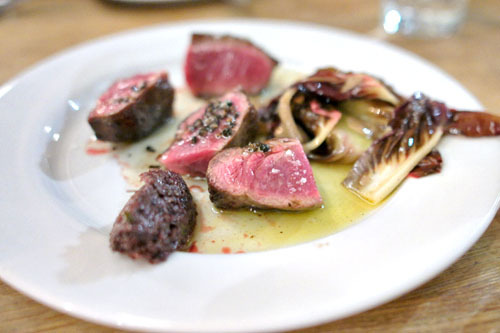 Throughout these past several years, Ludo has sort of defined, refined, and served as the vanguard for these ephemeral restaurants, and in the process, garnered legions of fans, as well as seemingly as many detractors. For some of you, the end of LudoBites couldn't have come any sooner, and for others, this marks the regrettable end of an era. To send off LudoBites in proper fashion, the team has dug deep and revisited the past, presenting a selection of plates from previous iterations of the roaming restaurant, as well as a couple of new dishes thrown in for good measure. Note that courses marked with an asterisk on the menu include a donation to St. Vincent Meals on Wheels' Cart for a Cause program. Click for a larger version. Our first libation of the evening was brought by one of my dining companions, and came highly recommended by Akili Steward (formerly of The Royce, Magnum, and The Dining Room). 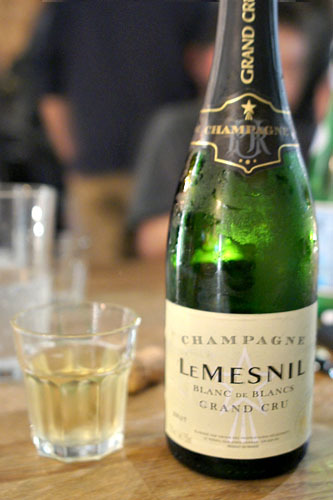 It was a Champagne from Le Mesnil, a cooperative of growers from the Grand Cru village of Le Mesnil-sur-Oger (the same place where Krug's vaunted Clos du Mesnil comes from). The bubbly really was a shining example of the 100% Chardonnay style, exhibiting deliciously light, yet substantial notes of apple and lemon and a great acidity, all grounded by an undercurrent of toasty goodness. We began with the hamachi, a favorite of mine from v6.0, and again, one of my favorites tonight. 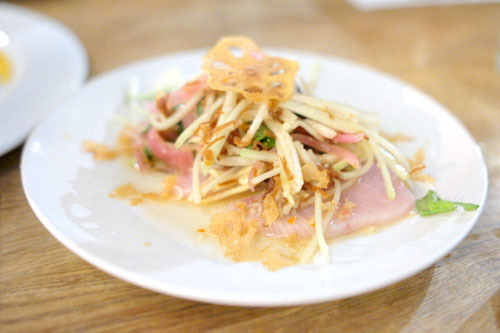 The fatty fish itself was spot on, sure, but the magic of the dish really came from all its accoutrements piled on top. Contrasting tastes of sweet, sour, and savory really did a great job counteracting the heft of the yellowtail, and I adored the herb-y, aromatic veil that enrobed the dish. 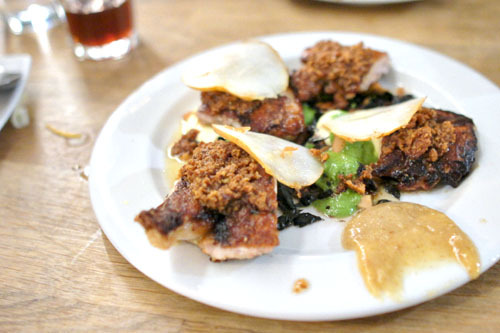 A lovely mélange of textures, too--just a perfect homage to Southeast Asian flavors. The prawns, a reworking of a dish from v4.0 I believe, weren't as successful. The texture of the shrimp was on point, with a soft, springy, supple consistency that I enjoyed. 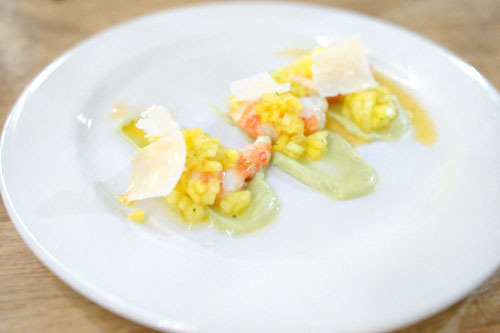 However, though the avocado served as a lush, integrating element in the course, the sweet 'n' sour nature of the pineapple tended to dominate on the palate, somewhat obscuring the natural sweetness of the prawn. I did, however, appreciate the counterpoint provided by the salty shavings of Parm here. 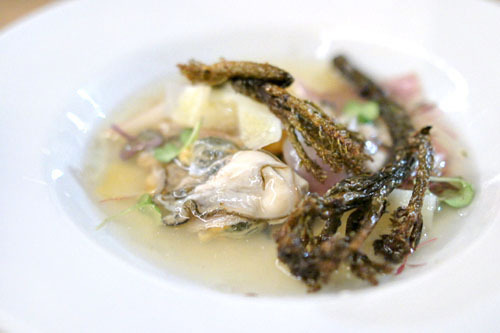 Ludo's so-called "Sea Creature" was, I believe, a new addition for tonight, featuring a bevy of shellfish set in a dashi-based broth (his ode to David Kinch's famed tide pool?). We had oyster, razor clam, Manila clam, and PEI mussel, a real explosion of salty, saline flavors that truly conveyed the essence of the ocean while offering up a nice array of differing textures. The key, though, was the bitter-smoky character of the broccoli, which provided a fantastic temper to the seafood, and I loved the crunch and piquancy of those shallots, too. 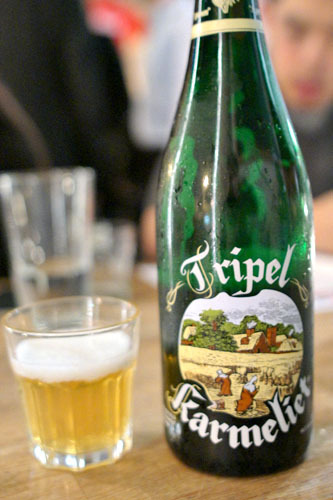 Moving on to beer now, another member of our party provided a bottle of Brouwerij Bosteels' Tripel Karmeliet, a beautiful example of the Belgian triple style. The crisp, carbonated brew showed off a good balance of citrus-y and herbal character, mixed in with some sugary notes and funky, bread-y flavors--nice! Next up was Ludo's legendary ham soup from v4.0, and it did not disappoint tonight. In fact, I think I liked it even more than before. It was a "liquid sandwich" of sorts, an immensely comforting, robust amalgam of bready, hammy flavors set off against the tang and crunch of the included pickles. Delish--I wanted some bread to sop up the remaining soup. 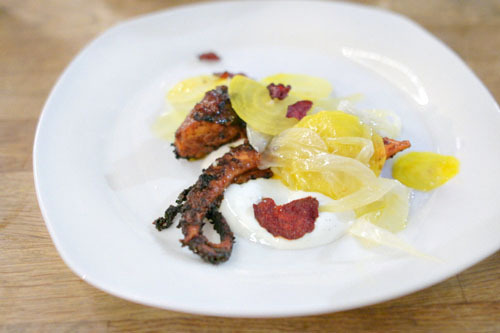 A rejiggered version of the tandoori octopus from v7.0 made an appearance tonight. The octopus itself was very nice, with a slightly spongy, supple, satisfying consistency and a boatload of sweet-saline flavors offset by a touch of bitter char. And amazingly, I actually enjoyed the beets here, with their crunchy texture and sour-sweet relish that worked surprisingly well in concert with the light, lactic tang of the yogurt. We had here Ludo's homage to pad Thai from v6.0, slightly reworked. The texture on the squid "noodles" was better this time around, with a very pleasing snap, and formed a great base to the dish. 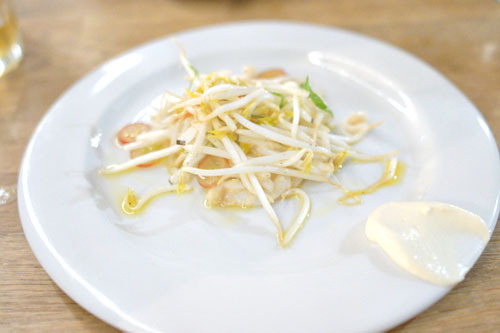 The use of peanut butter really did an admirable job tying all the various elements here together as well, but my favorite component was the bean sprout, which offered up a delightful crunch and lightness to the course. 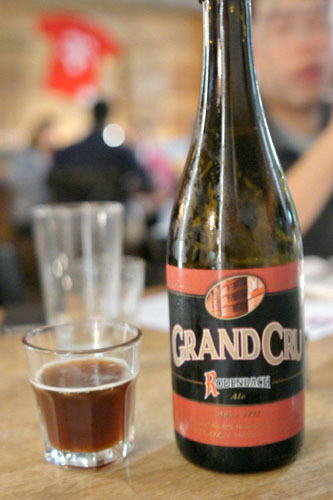 Here we had a bottle of Rodenbach Grand Cru that I pulled from my fridge. It was a superb example of Flanders red ale, and one of my dining companions even declared it superior to his previous favorite, Duchesse De Bourgogne. 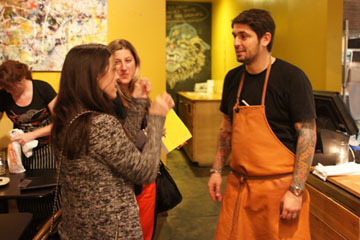 As expected, it showed off plenty of sharp, tart, acidic, and sour flavors that hinted at plum and cherry. At the same time, there was some malty sweetness going on here, and the oak gave the beer a lovely backbone of funk. A must try if you're a fan of the sour stuff. 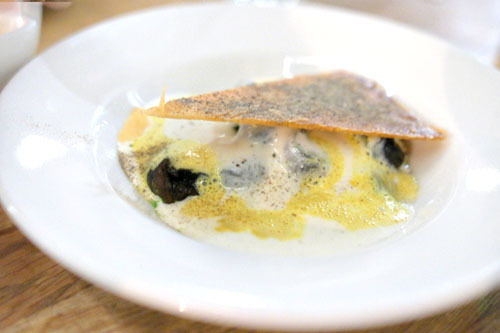 Here was another new dish that featured the most French of ingredients: escargot. The intense, earthy weight of the snails was proudly displayed on the plate, beautifully set off against the astringency of the spinach, while the mousse gave a hint of classic garlicky flair. The curry provided a further point of interest, while the brick tart added a lovely crunch to the course, though it was on the sweet side for me. 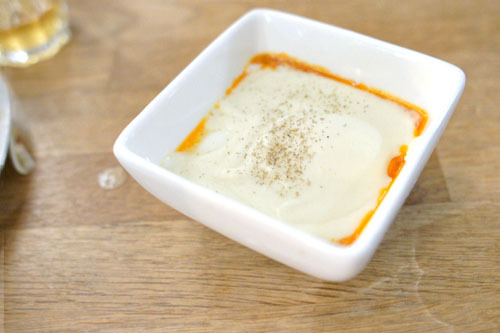 Making an appearance from v5.0 was Ludo's potato mousseline, which was as good as ever. The interaction between egg and potato in this "reconstructed Spanish breakfast" of sorts was flawlessly classic, and I thoroughly enjoyed the overarching whisper of spice imparted by the chorizo. Interestingly, a very early version of the dish had spot prawns thrown in the mix, and I wouldn't have minded them here as well to provide some more textural variety to things. Another newbie came in the form of this seemingly Shake 'n Bake-inspired preparation of chicken. The bird alone was pretty incredible, with a fantastically moist, juicy consistency and an immense depth of savor to it, all paired with a wonderfully crisp brioche crumble crust. Black mushroom and Parmesan added further weight to the dish, while the sliced pear served as a refreshingly light, fruity accent. 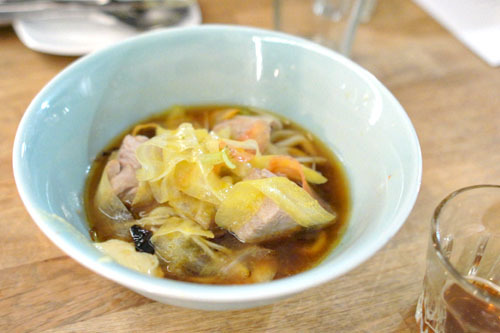 Our first item from the tumultuous v3.0 was this updated veal udon. The slick, jiggly noodles were a joy to eat, forming a great base to this cozy, heartwarming dish. 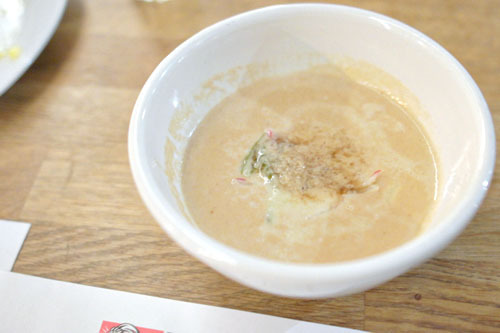 I loved the rich, umami-laced taste of the broth here, keenly enhanced by the deep, sweet sapor of caramelized onion. The veal itself was flavorful and hearty, but needed to be softer, suppler in terms of consistency; perhaps shredding the meat like last time would've been a smart move here. 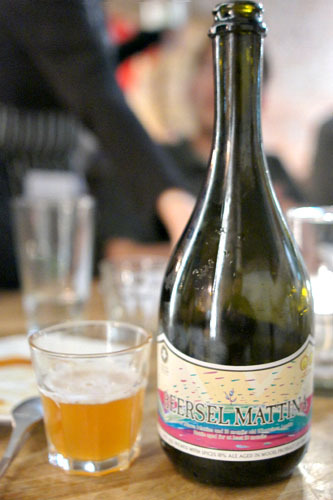 The Beersel Mattina was actually a gift that I received from Chef Jason Quinn of the excellent Playground restaurant in Santa Ana. This was a super rare, super intriguing bottling from Italy's Birrificio Del Ducato, a blend of Nuova Mattina saison and 18-month-aged Drie Fonteinen lambic. I actually really enjoyed it though, with its complex combination of sour, spicy, fruity, and grassy flavors, all underscored by a marked barnyard pungency. Definitely worth a go if you can find a bottle of the stuff. Our last savory was, to my knowledge, a new item as well. Done to a rare consistency, the steak was quite satisfying, with a rich, beefy, pepper-y relish doused with a positively intriguing, inviting undertone of fishy goodness. I also appreciated the further complexity imparted by the Maker's Mark-infused oil and chorizo, and the crunch and bitterness of the radicchio salad was welcomed, too. Our first dessert is undoubtedly Ludo's signature, and with good reason. Straightforward in concept, the dish comes from the Chef's days at Bastide and features but three main components, married in deceptively simple harmony. I first encountered it during v2.0, and tonight the dessert was as good as ever. 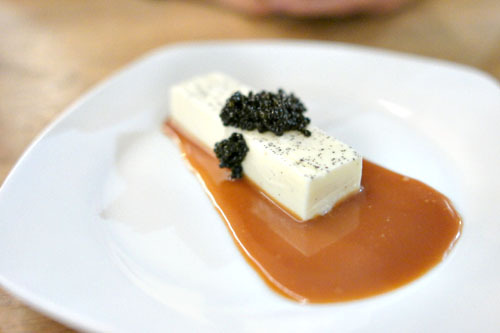 The key was the interplay between the caviar and caramel, which provided a salty-sweet balance of flavors that went flawlessly against the levity of the panna cotta. A somewhat jarring juxtaposition of elements, but one that's eminently balanced. Next up was the lemon meringue tart, which we'd had not too long ago at v8.0. 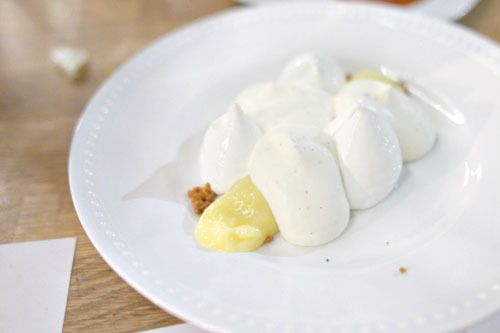 It was classic in essence, with the sugary meringue playing foil to the overt sourness of the citrus, all while the pie crust crumbles grounded and tied together the dish. 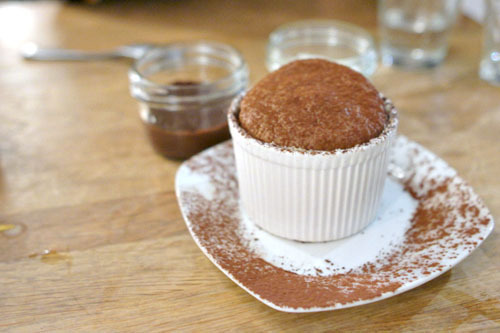 We ended with a fairly traditional chocolate soufflé, which last made an appearance at v4.0. It was a prototypical example of the dessert, but pretty much flawless at the same time, with the light, airy cake melding beautifully with the whipped cream, while the included chocolate sauce piled on even more decadence to the dish. Tonight was a night for remembrance, nostalgia--a trip down memory lane. It was nice to be able to compare and contrast the plates against those of past iterations, to see what still managed to fire on all cylinders, what exceeded past expectations, and what still didn't quite succeed in hitting the mark. 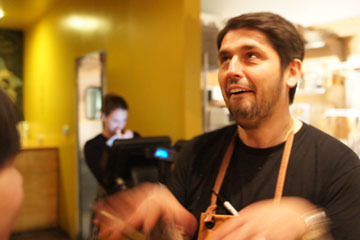 Love him or hate him, we can't deny the indelible impact that Ludo's had on the culinary scene here in LA, and beyond. He may not have invented the temporary restaurant, but he certainly popularized it, challenging conventions and the palates of countless diners in the process. 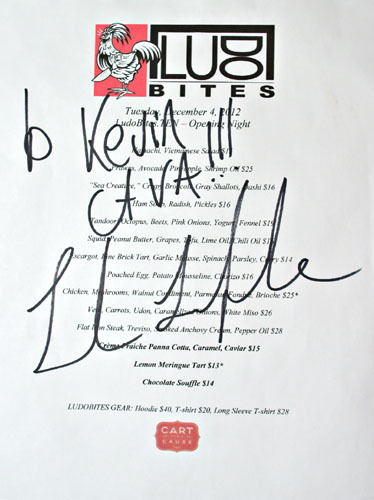 This meal was a fitting retrospective of sorts, and I'm a bit forlorn to see LudoBites bite the dust. 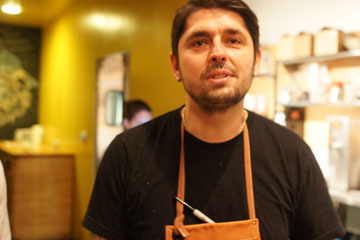 But perhaps we should be much more curious to see what the Chef has planned for us in the future in the form of "Le Routier," the reported Melrose project to be opened in conjunction with the Animal/SoaG dudes, certainly set to be one of the most anticipated, controversial, and hated on openings of 2013. It'll be an interesting year for Ludo, Krissy, and company; the pop-up king is finally settling down. Previous LudoBites posts: v8.0 at Lemon Moon , v7.0 at Gram & Papas, LudoBites America, v6.0 at Max , v5.0 at Gram & Papas , v4.0 at Gram & Papas , v3.0 at Royal/T  , v2.0 at Breadbar . Very cool to get your thoughts on the dishes compared to their past versions. I'm a bit upset with myself for never making it to one, but I'll just have to be sure to get to Le Routier. 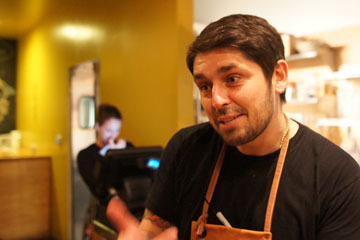 Just curious if you saw the Burgundy episode of No Reservations with Ludo having been in it for most of the show? If so, what did you think? I wonder if the chef has any behind the scenes insights or opinions. As always, great coverage man. I'm glad to hear he's going to a permanent location. I got tired of the Ludobites reservation system. By the way, I just got my hands on the cookbook yesterday. Congrats on all the photos and the one page insert. Roddy: Which iterations have you been to? Hopefully Le Routier won't be as bad to get into given that it's not a limited run. Anon: You know, I don't think I've ever watched a full episode of No Reservations before. Any highlights? Waleed: Thanks man--I was surprised to see that in there. But you're right, in a way I am relieved that all the rigmarole is going to be done with. Hi Kevin, I posted as Anonymous above. So I don't immediately answer a question with another, I'll share what I thought were some highlights. Anthony Bourdain and Ludo ate dinner at Ludo's grandmother's house which I found entertaining. 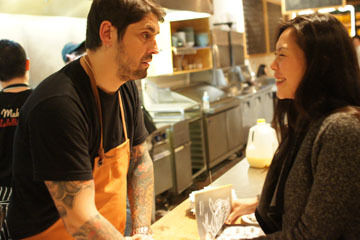 There were also a few scenes where they visited some of Chef Ludo's mentors and they reminisced about his early career. The last highlight for me was a visit to a Burgundian vineyard. Apparently it was founded in the last few years by a self-taught American. According to the show, the French people have been shocked to find a winery making such a good Burgundy that does not have a local at the helm. I wish I could recall the name of the winery, but I'm sure a visit to the No Reservations website would fix that. Thanks for the recap Josh; that actually sounds like an episode that I'd really enjoy. From the bits that I have seen from No Reservations, I actually do enjoy the show. I guess I just don't have the motivation to sit down and watch an entire episode.